From July 1988: the first issue of Marvel New York's THE 'NAM MAGAZINE. The black & white mag reprinted, at a larger page size, the regular comic book version launched in the last quarter of 1986 (the first issue boasted a December cover date). Each issue of the magazine reprinted two issues of the colour monthly. The magazine clocked-up ten issues, spanning the first twenty installments of the regular book. The core title eventually notched-up 84 issues but, despite early critical plaudits and mainstream media buzz, didn't stay true to its original goals of portraying the war in an uncompromising style... and in real time. Even the Punisher turned-up at one point to spike the sales. 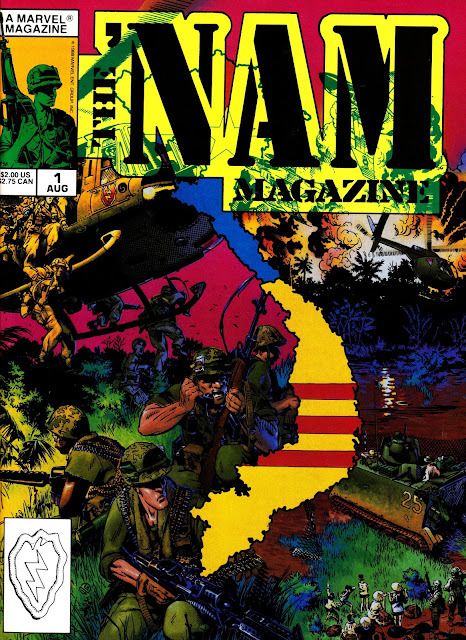 Doug Murray (writer) and Michael Golden (art), with Larry Hama (edits), were the initial creative team... although the traditional churn soon changed the mix. Appropriately enough, the strips were reprinted in the PUNISHER's UK weekly (after a brief run of the ROBOCOP movie adaptation to kick things off). 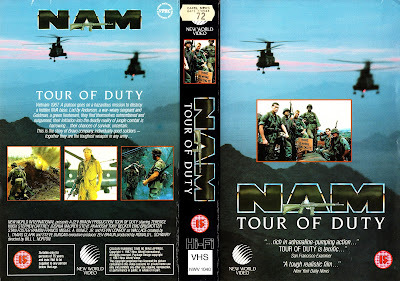 Roughly a year after the first issue of the comic went on sale, CBS started to air TOUR OF DUTY, a weekly Vietnam War drama produced by New World... who also owned Marvel. Some initial (fan) press coverage suggested that the show was an adaptation of the comic book. That wasn't the case (and probably never was the plan) but the success of the comic... and assorted feature films... must have convinced studio and network that the series had potential. It eventually notched up 57 episodes over three erratic (but always entertaining) seasons. 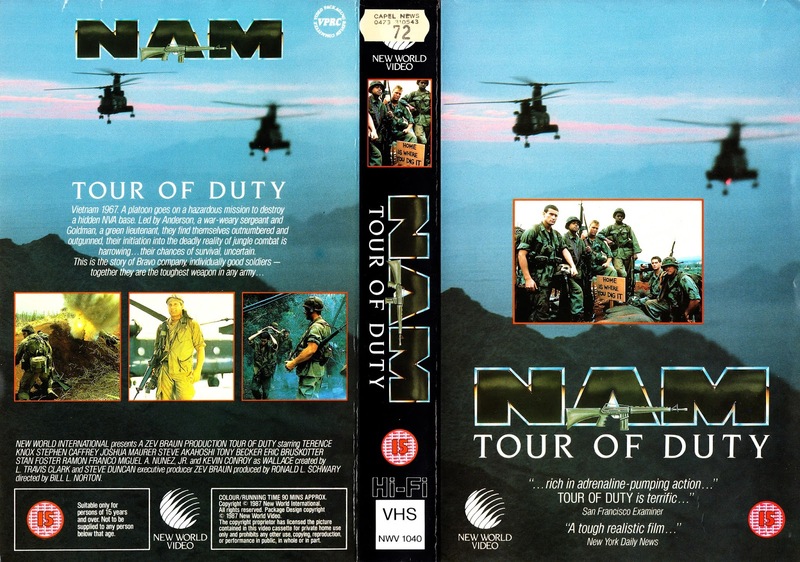 The first UK VHS release prominently featured "The 'Nam" on the box art... possibly a neat bit of intercontinental synergy... or possibly to help explain what local video shops... and punters... were getting. It was dropped from subsequent volumes.